Talk N Text has a great way of promo flexibility, after tracking most of its promo, I decided to share GA99. 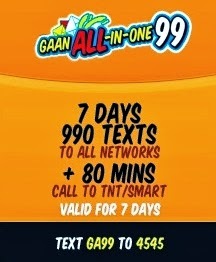 By subscribing to Gaan All-In-One 99 you'll have 990 text to all networks that is valid for 7 days, plus 80 minutes of call that can be use to TNT/SMART buddies. Well of course the price is pretty obvious (P99.00), the promo is also available on individual retailers nationwide. Lets put a little math on this, 99 pesos/7 days will yield 14 something, so its P14 a day, not bad TNT. Registration details after the jump. How to call: Dial *3535 + 11 number of SMART or Talk N Text subscriber. Enjoy this affordable promo from TNT, surely you have some friends in Globe/TM to get in touch with, well this promo has hit the spot on that matter. ako rin po hindi ko magamit ung call promo dito eh pano ito! Pa gawan naman po ng paraan sayang ang na load! Nagwowork pa po ba to? bakit not working na mga gaan all in promo nyo?